A quick Google search for the ‘best city in Spain’ and your search results will reveal Barcelona, Seville, and Granada, listed only after the one and only—Madrid. It’s no secret that Spain’s capital city has much to offer to the traveler looking for an authentic European experience. Madrid possesses the perfect mix of culture, food, history, and proximity to a myriad of surrounding towns to enhance your European explorations. Lying just near the heart of the Iberian Peninsula, Madrid is over 2100 feet above sea level, making it one of the highest capitals in Europe. Thanks to these high altitudes, the climate is low in humidity during the hit summers, making it one of the more tolerable cities during the summer. Getting to Madrid from the U.S. is pretty easy. Norwegian Air offers direct flights from many major cities, including New York, Los Angeles, and Ft. Lauderdale. We flew Norwegian’s Premium Flex on their 787 Dreamliner for a comfortable 7-hour commute from JFK Airport. Although most of Madrid is a walkable, there are plenty of options to cut down on your commute time. For those looking to immerse themselves into the daily flow of the city, Madrid’s metro is a surefire way to do it. With over 300 stations and 12 metro lines, Metro de Madrid is the third largest metro system in all of Europe and known as one of the least expensive. In addition, there are taxis, a bus system, Uber, as well a commuter rail to hop between cities. El Corral de la Morería – A visit to Madrid wouldn’t be complete without catching a Flamenco Show. Flamenco, a Spanish dance form derived from the southern regions is characterized by rhythmic movements with hand clapping and foot stomping to a story told over the harmonies of drums & guitar. At the Michelin rated El Corral de la Morería, you can enjoy a front row experience of Spain’s most popular performance over top-notch cuisine. The main auditorium of the Teatro Real. 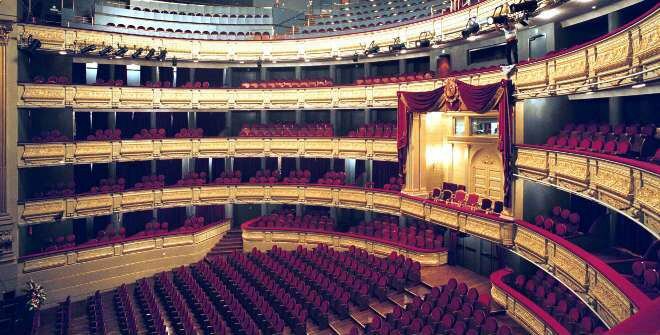 Teatro Real – Nationally regarded as Spain’s leading opera house, an evening at this place is a must if you wish to dive head-first into the culture of Madrid. Be sure to check the monthly schedule of events to catch a play, dance performance, or even a music concerts on certain days of the week. Gran Via – An afternoon stroll down this bustling main street of Madrid gives you direct access to the cultural heartbeat of the city. Catch a performance, go shopping, or grab a bite to eat. 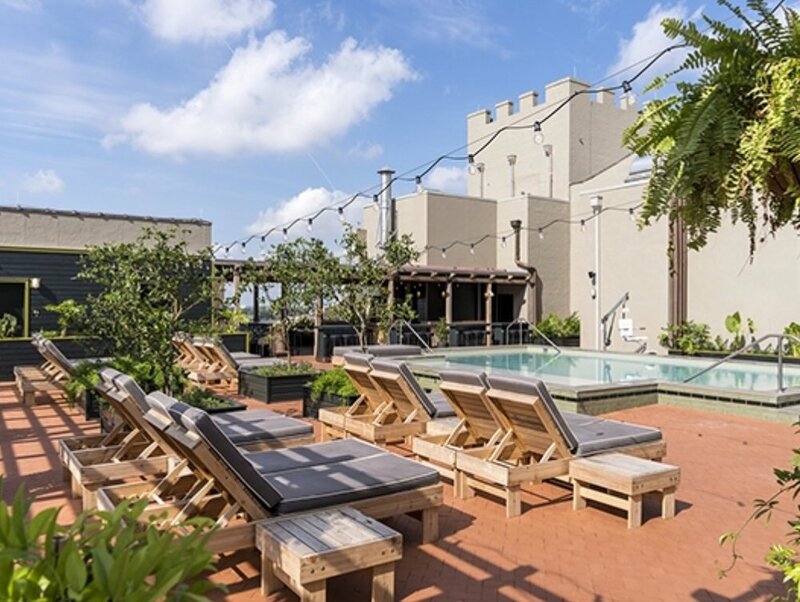 You can even barhop to a few of the best rooftop terraces the city has to offer. The street is nearly a mile long, so be sure to bring your walking shoes! The world famous Debod Temple at sunset. Debod Temple – Take a trip into Madrid’s past by visiting the Debod Temple. Gifted to Spain from Egypt in 1968, this temple dates back to the 2nd century BC, and sits on a hill that offers one of the best panoramic views of the southern part of the city from the Royal Palace to the Manzanares river to the Vicente Calderon Stadium. The Prado – It’s no question that the Prado Museum is one of Madrid’s main attractions. Featuring paintings from the 11th to the 18th centuries, The Prado boasts one of the most envied art collections in the world. Spend the day enjoying works from the beloved Picasso, Dali, Murillo, and Sorolla to name a few. Afterwards, you can meander through Madrid’s botanical gardens which sits just behind the museum! 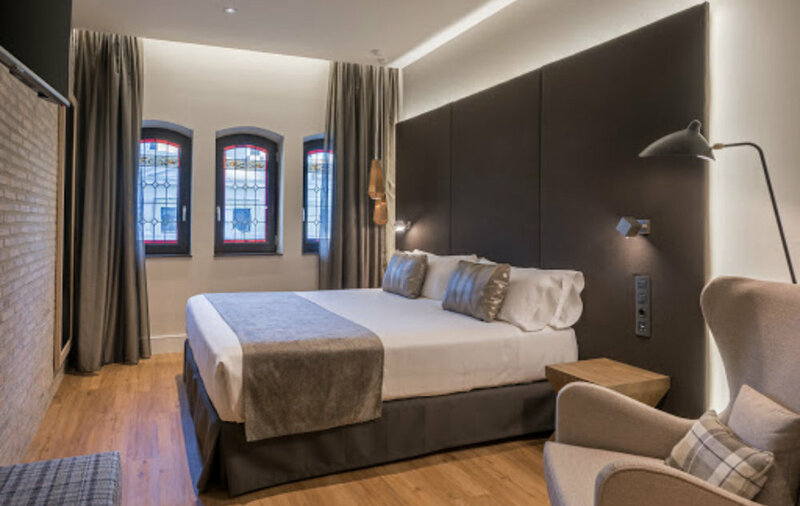 VP Plaza Espana Design – Across the road from Plaza de España park, this 5-star, modern hotel is a just a quick walk from a metro station and a 15-minute walk from tapas stalls at the iconic 1900s Mercado de San Miguel. 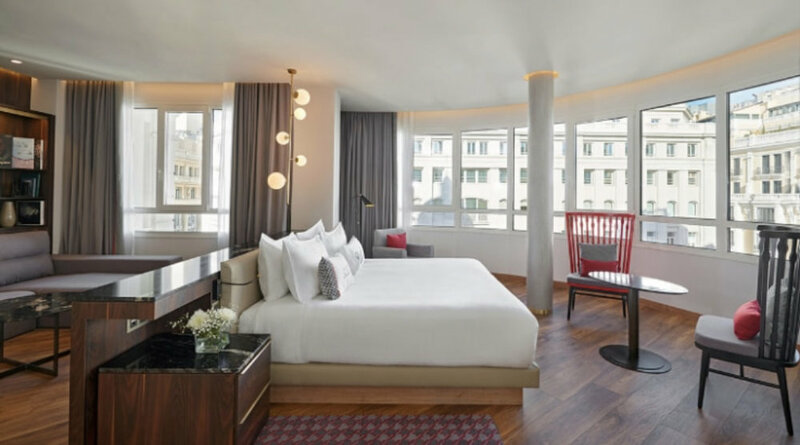 Hyatt Centric Hotel – Amid the nightlife and shopping along the upscale Gran Via, this modern, art deco hotel is a 2-minute walk from the closest metro station and just a 10 minute walk from Madrid’s Royal Palace. Hotel Catalonia Gran Via – Housed in an ornate 20th-century building along a Madrid’s main avenue, this sophisticated hotel is short distance from the Gran Via metro station and even closer to the the Museo Nacional del Prado. The main dining room of Gingko Restaurant and Sky Bar. Gingko Restaurant and Sky Bar – Gatronomy with a view. Enjoy this Mediterranean & Asian inspired fusion of delights accompanied by some of the best craft cocktails the city has to offer. The hip, art-deco inspired decor offers a comfortable, cosmopolitan edge to the atmosphere. Be sure to call in advance for reservations, the depending on the night of the week, you may even catch a live band performance. Taberna Del Albardero – This historic tavern, located directly across from Teatro Real in the Opera neighbohood is known for its traditional Spanish tapas with a world-class sherry collection behind the bar. Its historical significance enhances the experience: it served as a hangout tavern for the nobleman & socialites of Spain prior to the civil war. It’s open daily from 1-4pm and 9pm-midnight. Mueso Chicote – Enjoy evening drinks in a warm, cozy environment in the center of Madrid. This cocktail bar was a famous hangout spot to the likes of Ava Gardner, Salvador Dalí, Ernest Hemingway, and García Lorca. This is the perfect place to begin your night on the town as it sits on the busy street of Gran Via. Tartán Roof Bar at Azotea del Circulo – Situated at the top floor of Circulo de Bellas Artes (The Building of Fine Arts) you’ll find the prodigious Tartán Roof bar where you can experience 360˚ views of the Madrid skyline at sunset. The menu features classic Spanish tapas with specialty cocktails or even a simple cup of coffee. There’s an elevator fee of 3 Euro to travel to the top, so be sure to bring cash with you. Coque – Treat yourself to a 2-Michelin star experience at one of Madrid’s most exclusive restaurants. This interactive, sensory experience takes you on a palette stimulating tour of the entire 2-story restaurant. Have a welcome drink at the exclusive cocktail bar on the lower level, to champagne & wine in the cellar, to premiere tapas served in the kitchen, all the way up to the dining room where you’ll be immersed into Madrid’s nonpareil cuisine. Sommelier Alejandro, of Restaurante Coque serving white wine in the cellar. From left: Kent Johnson of Black & Abroad, Chef Mario Sandoval of Coque & Eric Martin of Black & Abroad. Madrid in a nutshell is bursting from the seams with history, culture, and art, with gastronomy that leaves nothing to be desired. As an added bonus, its proximity to surrounding small towns make for perfect day trips should you have the additional time in your itinerary. To enhance your experience even further, Spain’s commuter rail, Renfe offers you access to 29 different cities right from Madrid. You can comfortably reach places like Barcelona, Toledo, or even Málaga for a fraction of the time it would take you to drive. Enjoy Madrid, and as always safe travels! Have you been to Madrid? Let us know some of your favorite things to do in the comments below! If you didn’t get a chance to make it to the 2018 Essence Festival, then you missed a stellar year! Flanked with celebrity exclusives, private screenings of your favorite TV shows and Marvel releases, and of course, the hottest performances, this year’s Essence did not disappoint! So here is a list of my favorite things from this year’s Essence Festival and what you absolutely have to do when you attend next year! This restaurant is divine. I had the privilege of attending STARZ’s “PowerBrunch” event here and it did not disappoint. The blue crab beignets, succulent pork, grits, fried green tomatoes, delightful quiches, and more, this restaurant is worth your time! So New Orleans gives NYC a run for its money on being a city that never sleeps and after the concerts, hunger is sure to pull you in! Gene’s is the perfect place for a delicious po-boy 24/7, but particularly in the wee hours of the night. This is spot is cash only, but so so worth it! Get the fried catfish po-boy, that is my recommendation! You’ve likely been here before, but if haven’t, do it for the Beignets and coffee, enough said! Don’t let the long line deter you, it moves quickly since there are only two things on the menu, but be sure to bring cash here too and take them to go while you see more of the city! While I chose a different route for my stay this trip to New Orleans, I did find myself at events at the Ace Hotel every day. From their delightful bar with craft cocktails to partying at their rooftop pool for the dynamic “Cantu Curls & Waves” bash, Ace is the place to be during Essence Festival. Their décor is chic and the service I encountered was spectacular. Also, it doesn’t hurt that the Ace was the host hotel for a secret podcast recording with Michael B. Jordan and a live Insecure wine-down recording with Issa Rae, Yvonne Orji, and Prentice Penny with a special surprise 4-song set performance from Ella Mai, singing songs based on and dedicated to characters of the show. Yes, Essence Festival is known for their stellar musical performances at the late- night concerts, but you need to experience the free events during the day at the convention center! I got to see an exclusive clip of If Beale Street Could Talkand got to hear the incredible process of making this ground-breaking film from Director, Barry Jenkins, and stars: Regina King, Kiki Layne, and Stephan James. Then I got to screen the plot twisting episode 5 of Claws’ second season. Afterward, Niecy Nash and Jenn Lyon were on hand for a dope Q&A where they shared what their hopes for season 3 are for their characters, and if they think that spoiler, Bryce is still alive. Things I wanted to catch but didn’t have a chance: screening of Episode 2 of Season 5 of Power and a screening of Ant-Man & the Wasp! No other place to be at 7 pm than the Superdome to take in all of your favorite performers on various stages. I got to checkout Xscape, Idris Elba, Snoop Dogg, Miguel, Queen Latifah, Mary J. Blige, The Roots, Jill Scott, Erykah Badu, Guy, and closed out with Ms. Janet Jackson. If you missed Janet’s tribute to her late father, check out highlights here. Every performance was a great time and a trip down memory lane with these artists who all have songs on the soundtrack to my life! So next year, when you venture down to New Orleans for Essence Festival, you know where to play, where to eat and of course where to go get all the exclusives on your favorite TV shows and films. As always, you know where you hear the hottest music from artists you love! See you next year at the best black family reunion around!